Yesterday I left home earlier than usual to go to a workshop on outdoor education. The goal was to gather ideas on how to take learning outside. I was excited as I looked forward to learning new things and spending some time outdoors. I loved being surrounded by trees for most of the day. 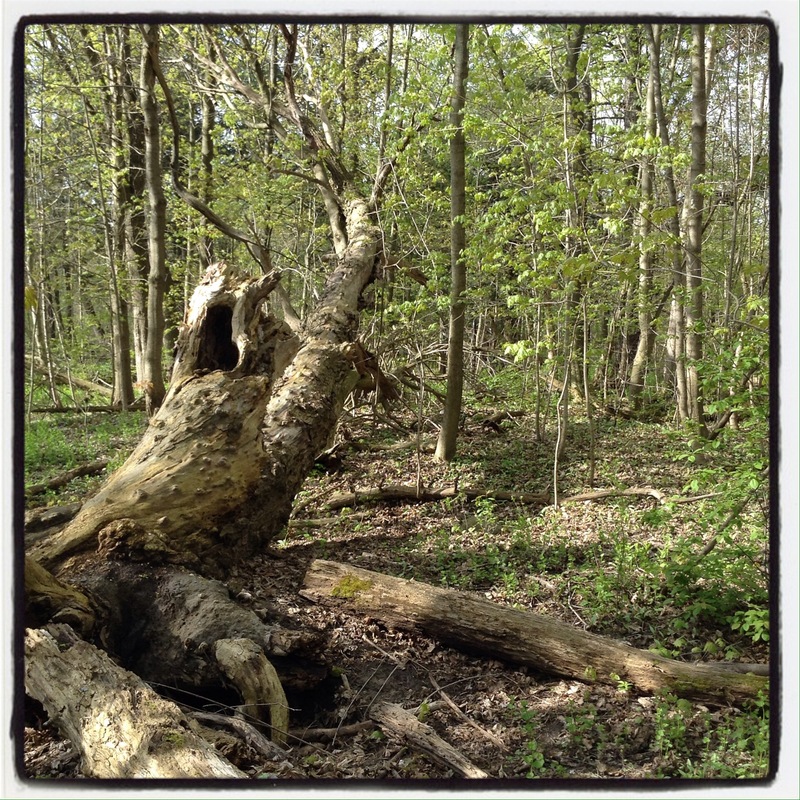 I walked a bit in the forest – and had my sessions surrounded by trees. I enjoyed smelling the fresh air and listening to the sound of the trees whispering in the wind. Rejuvenating! 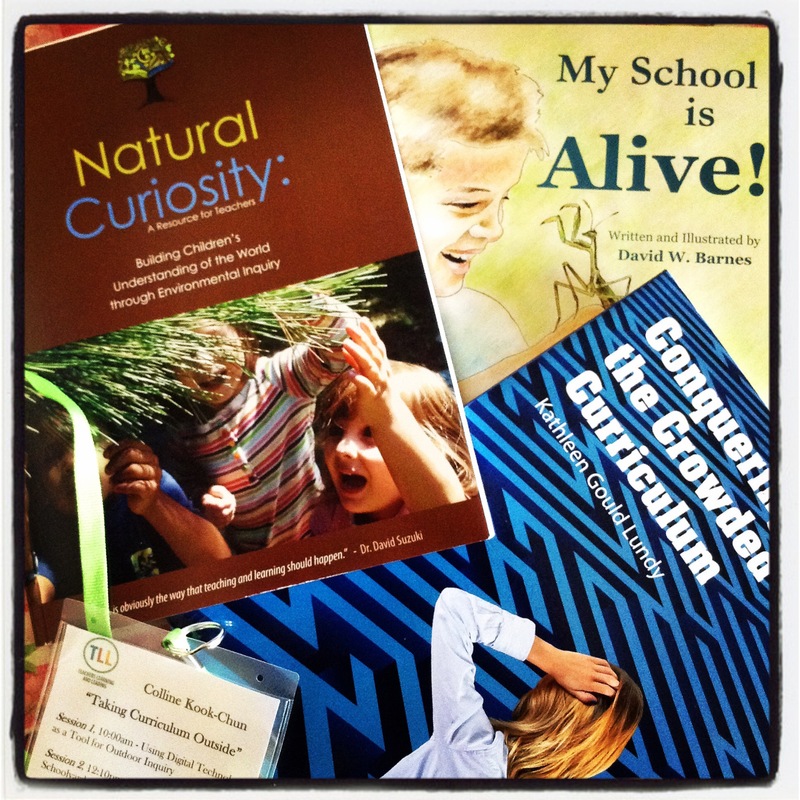 In addition to being surrounded by nature during our sessions, we were introduced to some nifty ideas that we could implement with our students. 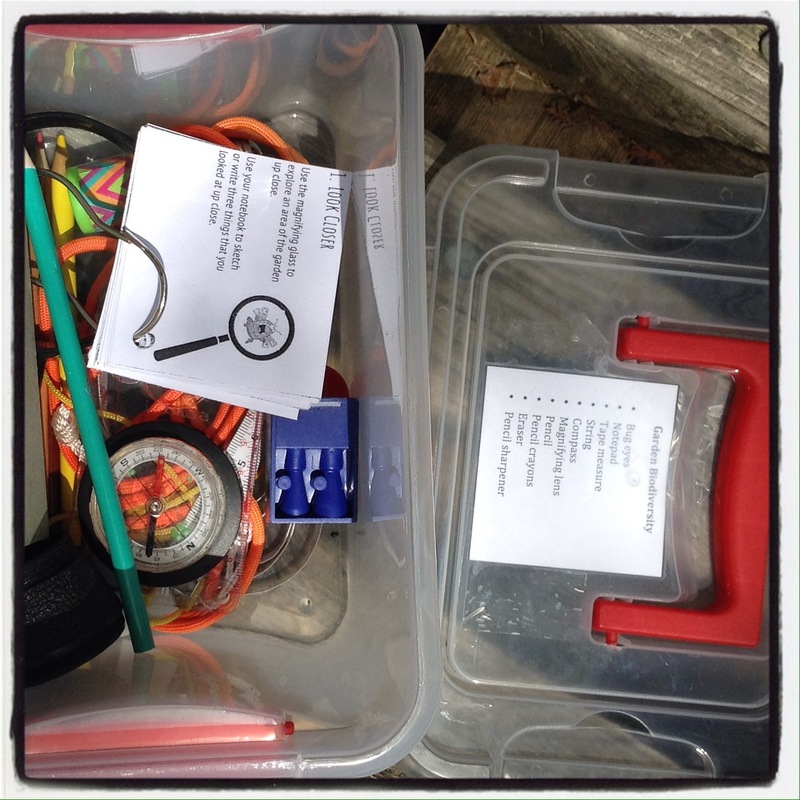 I loved the idea of an outdoor inquiry toolbox for children to use while outside. The day ended with a motivational speaker, Kathleen Lundy. I have heard this experienced educator speak before and both times she has spoken to the heart. 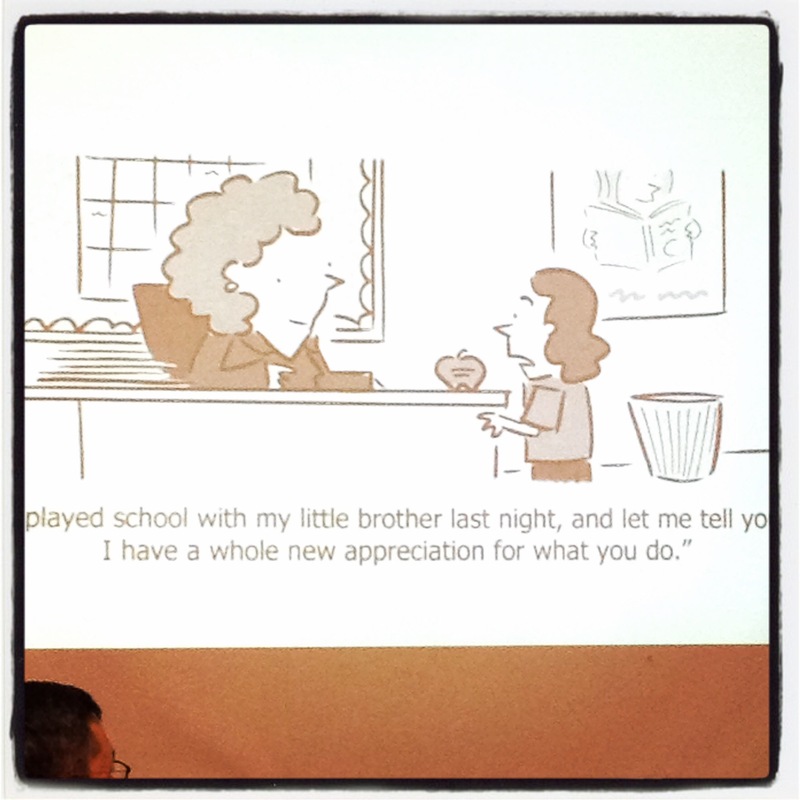 Yesterday she put up a cartoon that encapsulates what a difficult task it is to teach. As always with the group of people who run the workshops in the Beginning Teachers department, we received a gift of books. One, Natural Curiosity, I have been wanting to read for a while. And the other? I am always on the lookout for ideas on how to integrate the curriculum in my programme. And even though the picture book we received is in English, I can use the pictures to talk to with my class. Yesterday was a lovely day and one that caused me to smile all day long. As a teacher myself, I can fully appreciate the idea of opening up the classroom. While I fully accepted the need for a National Curriculum, I am rather dismayed at how very academic the early years UK classrooms have become as children at that age are endlessly curious and learn by DOING rather than being talked at… It sounds like a lovely day, Colline – no wonder it left you with a smile on your face. And thank you for the cartoon – it made me roar with laughter! I knew that teachers would appreciate it. I find, as well, that the Early Years curriculum is too structured. I find myself rushing to finish it instead of focusing on the kids’ interests. That is why the new Ontario kindergarten curriculum is so much better – it is open-ended and allows for play. Outside learning is a very cool idea. I’m sure it will reach some kids that sitting in a classroom misses. It does. And it seems to calm down some kids too. Back in 1955 when I went to the village primary school in England they used to take us on nature walks. I just loved it and to this day I still remember finding a huge bright green caterpillar on one of our little excursions through the woods. I think it’s wonderful, and important to show children nature. Great post Colline! We definitely don’t get enough of nature enclosed in the four walls of a classroom. And children always love being outside – even if it is at a park. What has caused me to smile this week? A little boy in my class was surprised to find that the word ‘bananas’ had two n’s in it!